CBD oil seems to have sprung into the forefront of public awareness as a remedy for all kinds of ailments over the past few months. Most notably, medical research suggests that this oil can act as a very effective anti-inflammatory agent. With pain from the moment I wake to the moment I sleep, could this be what I’ve been missing from my life? Many of you will know that I have Chronic Pain. It’s something I’ve lived with for the past four years and, for me, is the worst part of my Chronic Fatigue Syndrome. When I was first diagnosed I was told that there were only three options for medication. One made no difference, one made me feel sick, and the other takes just the edge off the pain which makes it slightly more bearable to live with but still very much a part of my daily life. So when I was approached by Synerva CBD Oils to review their oil I jumped at the chance. I have heard so many great things about it from other users, quite aside from the research, and I was eager to give it a go. With my prescribed medication appearing to be losing its effect, my pain is spreading at speed throughout me and I desperately need to find a way to stop it. The CBD oil sold in the UK is extracted from the resin of the hemp plant and is completely legal. There is virtually no THC (the psychoactive component of cannabis) in a hemp plant, but it is rich with CBD. 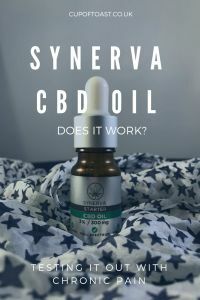 Synerva CBD Oils source their oil from Colorado, USA. It is grown under strict guidelines which means that it is completely GMO and pesticide free. Synerva CBD Oils are also 100% free from THC. The desired effect of ingesting this oil extends beyond pain relief for some users, with a better quality of sleep and enhanced feeling of good health also being reported. In fact, although it is most widely used to combat chronic pain, there are numerous health conditions from which relief has been found through taking CBD oil in some form. These include Multiple Sclerosis, Crohn’s Disease, Anxiety and Depression. I took the oil in liquid form. It is available as capsules or gummy bears too but these weren’t vegetarian. To begin with, honestly, I felt a little sick. A phone call to the company quickly put me on the right track though, by suggesting that I take the oil away from the time of day that I have my prescribed medication. This showed the expertise of the company, and did the trick. Some users report finding the oil difficult to stomach on their taste buds. I applied the oil under my tongue and didn’t find the taste unpleasant at all. It is a little like a slightly bitter salad leaf. I am still in the process of building up my intake of this oil to enable it to fully work its magic. The company suggest that you start “low and slow” to get used to it. I started with 2 drops in the morning and 2 drops in the evening of a 3% starter oil. This equates to approximately 1.5ml per day, which of course is not very much at all. I have recently increased my evening dose to 3 drops and will increase my morning dose too. What I have already found though, is that I am not relying upon my arthritic support gloves quite so heavily. It hasn’t increased the function in my hands but the pain has been reduced to such an extent that, for example, I am typing this without my gloves on. A few weeks ago I could only manage a very short break from them before the pain became unbearable. I have not yet found the sought after ‘sweet spot’ where the oil is fully working to alleviate my pain, but I am certain that it is not too far away. Living with pain everyday I am content to be patient and do not expect a quick fix, which this is not. Having already felt the very faintest of relief though I have hope that it will work and provide long term relief from a condition that is not at all easy to live with. For more information on Synerva CBD Oils, please visit their website here. N.B. 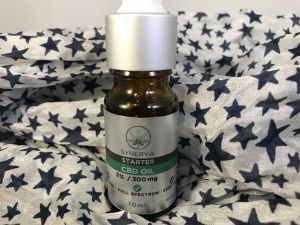 I was gifted a bottle of the Synerva CBD Starter Oil for review purposes. All opinions are my own. Please see my disclosure page for more information. So far I am certain that it is making a difference but I also think that I need to steadily increase my dose. I have high hopes and will follow up when I find that all important ‘sweet spot’. How wonderful that you’re finding a way of relief! I’m so glad it’s working for you and I hope you find your sweet spot soon so you may do every day tasks comfortably! Good question! CBD is short for cannabidiol. It is one of the cannabinoids found in a hemp plant. Cannabidiol is an active compound, long known to have medicinal properties. It does occur in cannabis plants too (along with another cannabinoid referred to as THC which is the psychoactive component), but CBD is higher in concentration in hemp (it constitutes around 40% of hemp extracts). The CBD oil taken medicinally normally consists of extracts taken from the stalk and seeds of the hemp plant, and does not contain THC. I hope that answers your question? Thanks. There has been research worldwide which is slowly building a very positive profile of the wide ranging benefits of this oil, especially as an anti-inflammatory agent. I’m really excited to be using it and already feeling some benefit. I am sure that I will write one to let everyone know how it’s going. I’m excited to be on this positive journey and try it out! Thank you lovely. It is nice to have a break from them, especially in this hot weather!